How much do you really know about home accessibility? There is a lot of misconception and downright fear about modifying the home. Movies like "The Money Pit" or "Mr. Blandings Builds His Dream House" promise you'll go broke or crazy! On the other end of the spectrum are medical rehab lists of do-it-yourself tasks (tacking down throw-rugs) and off-the shelf purchases (grabbers), suggesting that renovations aren't even necessary. What's a homeowner to do when the home suddenly seems full of hazards? Surely, any construction project is a daunting endeavor, but illness and injury complicate everything. The urgency of a medical condition raises the stakes, while medications can cloud thinking. Aging is full of surprises, and many people would prefer the old-and-familiar over the new-and-improved version any time. Asking others what to do doesn't help, when everyone has different advice. Let's try to distinguish between myth and reality. An accessible home is a home first, and warrants the same attention to detail and quality as any renovation. Integrate a sloped pathway into the site and match the ramp to your building's architectural character for a seamless look. (You'll also avoid broadcasting that a person with disabilities lives there!) Carve out a little extra space by removing walls and opening up doorways—you'll be rewarded with natural ventilation and sunlight! Shop the web for cool products—you can now get grab-bars in colors, with wavy forms that complement any bathroom décor! Pay attention to appliance selections for a good fit and with the user's abilities. Choose comfortable handles and knobs, good color contrast for visibility, responsive keypads that click or bing when you hit the buttons. Features like this make the home more enjoyable for everyone. 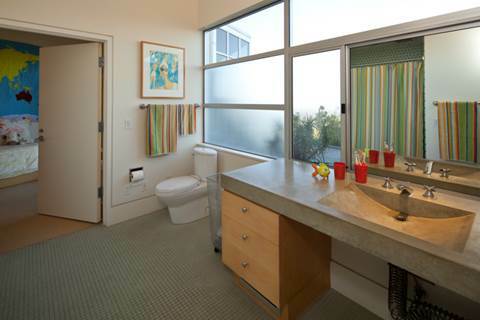 How many accessible features can you find in this bathroom? There's a roomy toilet alcove, seamless flooring, wide doorways with no thresholds, low windows and a low mirror, a vanity sink with space for a seated user's legs, and a shallow sink. Myth 2: Accessibility is Expensive! What are the alternatives? 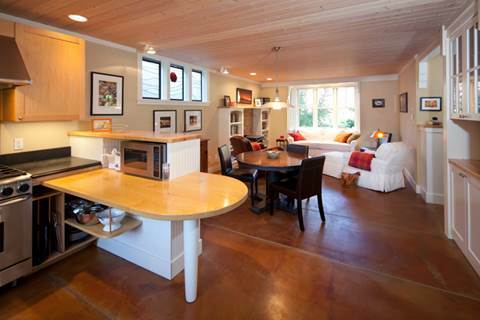 Modifying the home will save money over the long term. Consider this: the average cost of assisted living in Massachusetts is $4,300 per month, and can be as high as $7,900 per month. A week of round-the-clock in-home aides cost $1,895 in 2008 - that's about $6,000 per month. So a bathroom remodel will pay for itself in 2-3 months of independent living, and improve your safety and peace of mind long afterwards! If you're just replacing the toilet or sink, that's a payback of less than a week. For a roll-in shower, it's more like a month. With a little ingenuity and effort, it's possible to reduce the inevitable costs. Search the web for gently-used appliances and recycled building materials. Compare prices and shop around—check out your local lighting showroom as well as Home Depot. Ikea cabinets are much more economical than custom or semi-custom work, although you'll have to assemble them. Look for grants—advocacy organizations such as the MS Society or ALS Association often have funding assistance. Contact Home Free Home, a nonprofit that matches pro-bono architects with qualifying low-income homeowners for modest access upgrades. 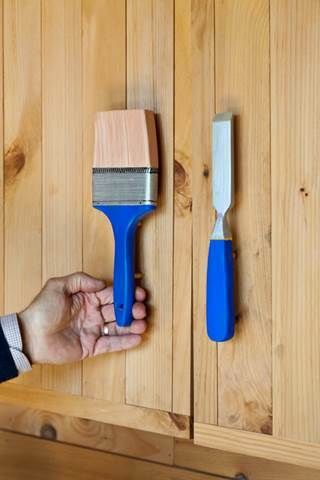 Talk with your accountant and your doctor about medical deductions for health-related home renovations; you may be eligible for tax savings. Talk with your insurance agent, as there may be reduced homeowner policy premiums or coverage for certain projects under Long-Term Care Policies. Comparing apples and pears, sometimes you just can't afford Not to renovate! Save the cost of walls and doorways, wood trim and paint—think curtains! The owners can adjust the bedroom's size and functionality in their loft by pulling the curtain open and shut. Cabinet doors are easier to use when muscle tone weakens if looped pulls replace knobs. This workshop storage unit was an enjoyable weekend project for a crafty homeowner! Myth 3: Accessibility takes up Space! 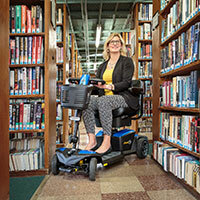 Doing wheelies in a power chair requires a five-foot diameter circle—what house has many spots where turns can be made? Leaning on a partner's arm when walking becomes difficult requires wider halls and doorways, or side-stepping together, but the "average" house is designed for single-file travel. A reasonable conclusion is that everything needs to be bigger in the accessible home. If you think of what can be removed, rather than what must be added, possibilities are revealed. 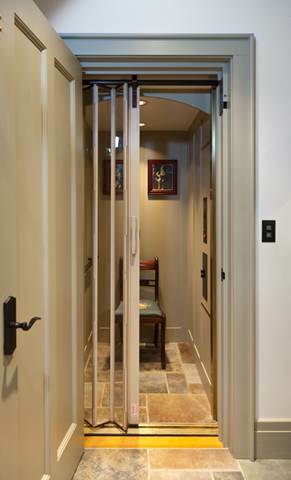 By taking down a wall, adjacent rooms gain useable space because they share a common path of travel. By subdividing a large living room, you gain a space for hobbies or even a bedroom at the main floor level. Enlarge the bathroom by making the kitchen smaller—it is easier to work in a compact and thoughtfully planned little galley, where everything has its place and is within reach. It's more about Smart than about Big. 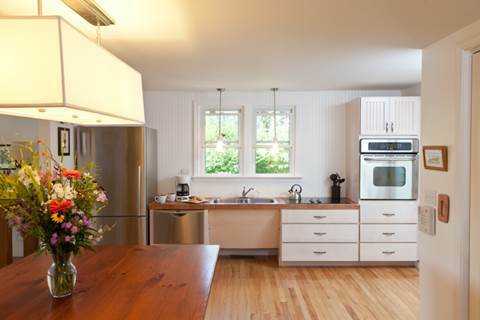 By putting that cabinet on wheels and adding a top, you double the work surfaces. Removing the cabinet, you double the seating area at the snack bar! Presto – more space with more thoughtful details. 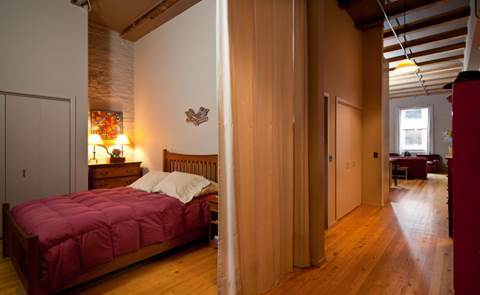 Three rooms occupy a 450 square-foot space. Walls would make each room feel tiny and dark. Grouped into one multi-use living area, these activity areas make for easy travel and easy communication within the home. 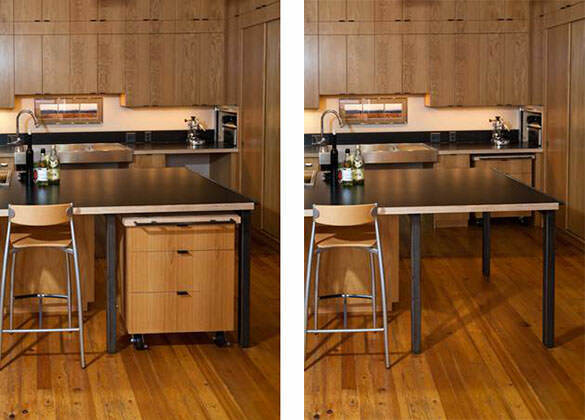 This compact kitchen is easy to use because each workspace has several functions. The cook can reach nearly all her appliances with a travel distance of only a few feet. Myth 4: Access upgrades Detract from re-sale value. With an accessible home, you appeal to a wider pool of prospective buyers. I am starting to see realtors who specialize in finding homes for buyers with disabilities. Some are asking me to speak to their colleagues who want to be more competitive in an aging market. As with any renovation, the most successful projects are both well-conceived and well executed. So integrate the accessibility improvements seamlessly into the home. If you're adding a ramp, use the same materials as the landscaping or the porch. I saw a house in Atlanta's post Buckhead neighborhood with a big sign in the yard: "For Sale – Elevator Included!" This is the world of the future, and it's here now. Carrying the room finishes into the elevator makes it a beautiful part of the house. 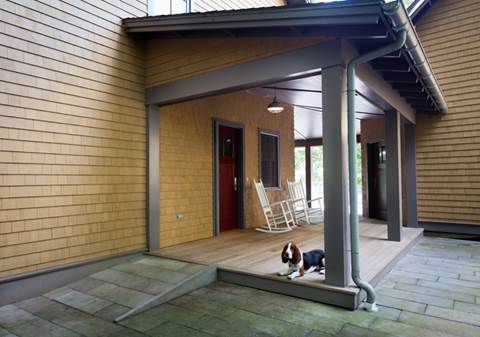 Matching ramp materials to the patio seamlessly integrates it into the porch design. Note the raised curb at the open ramp edge, an essential key to avoiding roll-off!